For a lot of people bicycles mean freedom, from the day that you first learned to ride right on up into adulthood and beyond, when you climb on your bike to get some “me” time away from the office, the cellphone, the email and the FaceTweets. But becoming a parent is a game-changer. Suddenly, many of the things that seemed so important become much less so, and the bike that used to see regular use ends up in the garage, propped up against the wall behind the snow blower, gathering dust. It doesn’t have to be that way. 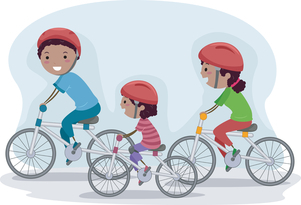 Biking with your kids, regardless of their age, can be a lot of fun – and when you’re out there with them in the saddle, you can bask in the warm glow of a parenting win as your kids develop a healthy habit that will last them a lifetime. Every child is different, but one thing’s true for all of them: they grow. And when it comes to bicycling, that means you’ll need different solutions depending on the age of your child. What works for an infant won’t work for a nine-year-old. For children who can’t yet sit up on their own, a “family” bike might be something to investigate. Family bikes, some of which can accommodate two infants and a rider, are specifically designed for safe riding with small children. They can be pricey, though; some run into the thousands of dollars. For parents on a budget, a bicycle trailer is a good call. There are many different choices in size and style, and a growing number of car seat manufacturers are making their products compatible with bicycle trailers. When your child’s around a year old and can safely sit up on her own, hold her head up and wear a helmet, a front or rear seat that mounts to the frame will work well. Rear seats usually have higher weight limits, which means they will last longer than a front seat because they can accommodate children as they grow. For older kids who aren’t quite ready to ride solo, a “Trail-a-Bike” system (basically a rear wheel and seat that attaches to the seat post of an adult’s bike) is a good choice. Whether your kid is riding in a seat, trailer, or on their own bike, a helmet is a critical piece of safety equipment, and required by law for kids under 16. Given that kids tend to learn by example, you should wear your helmet, too, when riding with your children. When is a Child Ready to Ride Solo? This varies from child to child. Some kids are able to balance and ride a bike as young as 5, while others may not get it until they’re 10. Training wheels can be used to get your small child used to pedaling movements, and balance bikes (bikes that have just two wheels and no pedals or chain that a child can push around using his feet) can help develop balance. If you do go with training wheels, set them up so they’re flush with the rear wheel on the ground and the bike stands up with a minimum of wobble. As the child practices, the wheels can be gradually raised above the ground to encourage balancing, but to provide support should the child lose balance. When the child is balancing the bike without relying on the training wheels for support, they can be removed. Bear in mind, though, that installing training wheels requires loosening the nut that holds the rear wheel in place. You may want to consider speaking with a bike shop technician before you attempt putting a set on your kid’s bike. When kids start riding solo, a good choice is a simple bicycle with a coaster brake from your local bike shop. Although it might be tempting, don’t buy a bike that is too big so your child can “grow into it.” Riding a bike that’s too big is not fun and, more importantly, it’s not safe. A bike is a good fit if the child can stand over the frame without it touching his body. Some kids’ bikes have both coaster brakes and handbrakes, which help the child get used to operating a handbrake, but also provide the coaster brake as an extra guarantee of stopping ability. Don’t bother with gears until the child is demonstrating skill with a simple single speed bike. Remember to check the air pressure, brake operation, and chain condition every time your child rides. Once your children are properly fitted, you and your family will be all set to enjoy years of bicycling adventures. Frank Gallagher is the Communications Director for the Bicycle Coalition of Maine, the statewide voice of cyclists. Since 1992, the Bicycle Coalition of Maine has led the effort to make Maine better for biking and walking, working for bike and pedestrian-friendly laws at the state and federal level. The Coalition also teaches bike and pedestrian safety to children and adults, and runs several successful events, including the Great Maine Bike Swap, the Maine Women’s Ride, the Maine Lobster Ride & Roll, and BikeMaine.